The most important tool for any cook is a knife. How to choose the right knife requires some background information. There are so many brands, styles and types to choose from it can be overwhelming. There are different types of steel to choose from: carbon steel, carbon stainless steel and stainless steel. Which is best for maintaining a sharp edge the longest? Which is easiest to clean? Should your knife have a full tang, a half tang or a rat-tail tang? What length of blade is appropriate for you? How does the handle feel? How’s the weight/heft of the knife? What brand should I choose? There are so many brands and styles. The Japanese have made huge inroads into the American marketplace, which only complicates the decision-making process. I recommend the Cutco brand to my students. This is an excellent, high-quality knife that is moderately priced. They also sharpen their brand knives for free. You pay shipping both ways. For me this a bargain; I have two full sets (one was kept at NYU when I was teaching) and steak knives. The shipping is $14.o0 for around 30 or so knives. 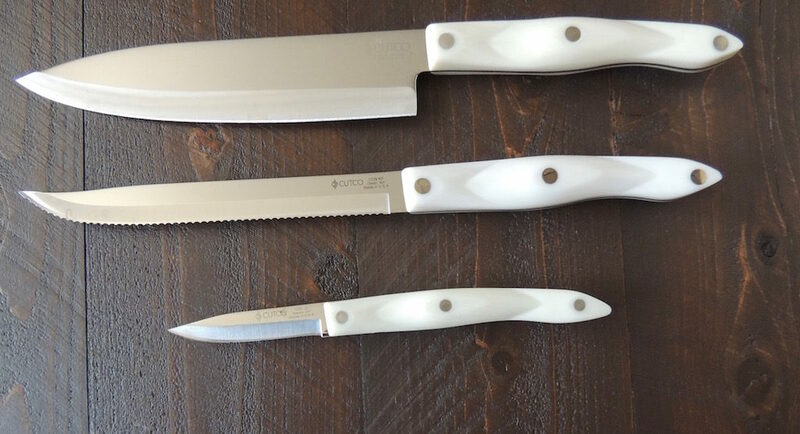 Are there basic knives that every cook should have? Absolutely. The knives below are a 10-inch chef’s knife, a bread knife (serrated edge is best especially for crusty breads) and a utilitarian paring knife for small tasks. These are all important factors to decide on when selecting a knife. Check out our playlist on YouTube for a complete lesson in knives and knife skills. Watch the How to Choose a Knife video here and get the answers to all the above questions. For additional information see a comprehensive review of knives on review.com.